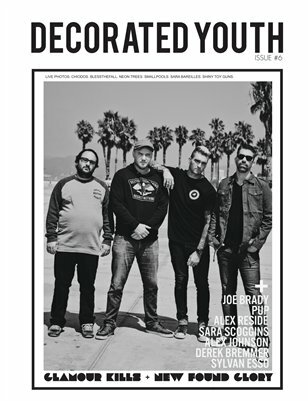 Our sixth issue features our first ever shared cover, with an interview with Chad Gilbert of New Found Glory and another interview with Mark Capicotto, owner and founder of Glamour Kills. We also have interviews with; photographer Joe Brady, singer songwriter Alex Johnson, journalist Sara Scoggins, Nick Sanborn of the band Sylvan Esso, photographer Derek Bremmer, Steve Sladkowski of the band PUP, and photographer Alex Reside. Our live photo galleries feature, Chiodos, Blessthefall, Neon Trees, Smallpools, Sara Bareillies, and Shiny Toy Guns.